It was virtually the last piece of fax paper to roll out of the machine, striped with red edges, the end of the roll. Since we were moving to a new house the next day, there was no use to put a new roll in the machine now. We would have a new phone number, and there is no such thing as a tape-recorded referral number in Bangkok. My old friend Dharmaratna in Sri Lanka, had he sent the fax just a few hours later, would not have been able to reach me. It had been five years since I had seen him, although I had briefly been in Sri lanka a year before, in 1996, shortly after the Tamil Tigers had blown up the Central Bank in Colombo, killing scores of people. I had had a specific job on that trip to deliver money and to pick up stones, I called nobody. The fax read: "Urgent, there is a rare gem piece with me. Please contact me or my son immediately". I called him right back and he laughed mirthfully as he described finding a large gem crystal with his own hands that very day. He said it was found in the rain-soaked earth of his mine near the mist-shrouded mountains of Balangoda in southern-central Sri Lanka. It was an orange sapphire of over 400 carats-clean, bright, and a deep orange. He had not seen a piece like this in thirty years of mining, and I could sense the confidence he felt in his luck. Knowing how very rare such a piece was, I wanted to be a part of it. I flew to Sri Lanka. When I arrived in Colombo, Dharmaratna came immediately to my hotel. In my room. I held the crystal, which was as large as a chicken egg, 425 carats in the rough, with three natural crystal faces from the original hexagonal six till evident, yet frosted as if alluvial and water worn. One side was a concoidal fracture that was glassy and allowed a transparent, if concave, window through which I could see into the interior of the stone. This view showed that the stone was quite clean with none of the inclusions such as 'strong silk' or 'liquid feathers' that could impede the passage of light and affect the brilliancy once it was cut. The few cracks that it did have on the surface did not seem to extend deeply into the crystal and could easily be removed by cutting. On one of the frosted faces there were three or four parellel lines of blue caused by minute traces of titanium remaining from when the stone was formed, but they were confined to the outer skin. The stone told an interesting geological history, confirming that it had not been treated in any way. The color was tangerine orange. Although not the salmon reddish-orange of a sunset, called padparadscha, it was surely colored by a combination of chromium and a slight bit of iron. On first inspection, the shape of the crystal seemed to lend itself to a 'cushion' cut, losing a minimum of weight while retaining the maximum of brilliancy and luster. The table cut seemed obvious, being the largest surface and slightly rounded, leaving room for graceful 'shoulders' and crown facets. What could become the pavillion, the bottom of the stone, already had its angles present, as if they had been formed into the crystal by Nature. The stone seemed like it was born to be a 'cushion'. However, cupping it between my thumb and fingers and viewing it down the side rather than through the open face, I could see I was wrong. The stone would display a richer orange and the body color could be multiplied by cutting the table in the opposite direction, although the yield would be smaller. I figured that it could be cut into a single piece of 120 to 140 carats. 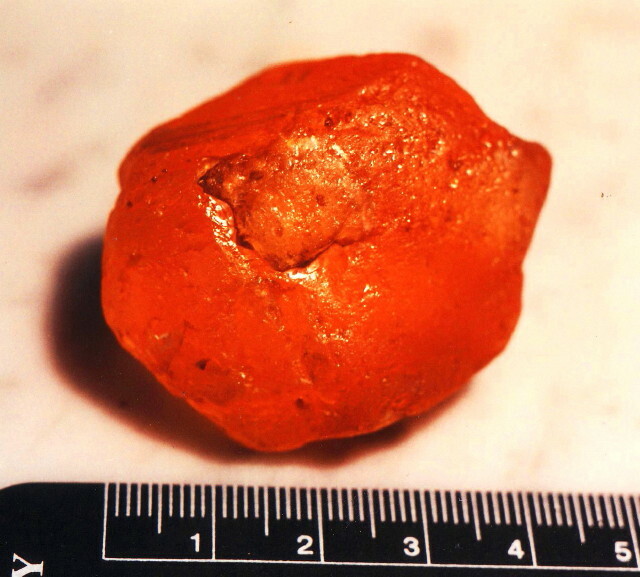 The potential was there to produce perhaps one of the world's largest orange sapphires. Dharmaratna only dealt in rough stones, since he was a mine owner, but I thought that if a cutter could just open a face, I could better determine the ultimate color and clarity. This however presented new problems. The first was the problem of secrecy. Could we find a cutter who would not betray to other dealers the existence of such a rare stone? 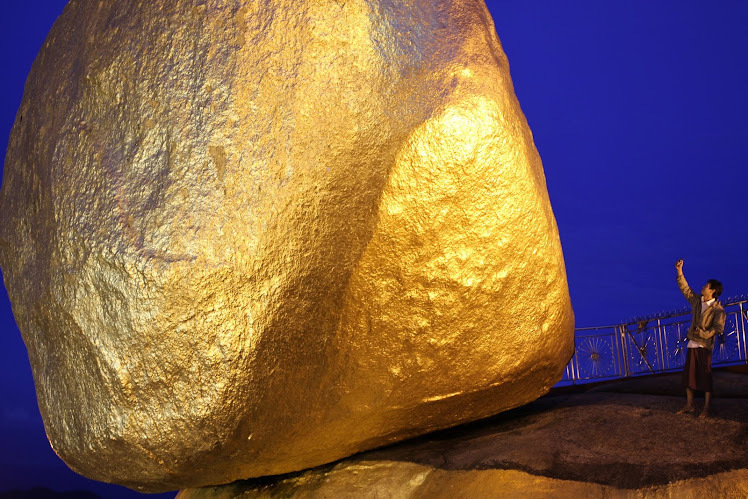 Another problem was that after the stone had been opened, Dharmaratna would see clearly what the stone would become, and would thus raise his price if it exceeded his expectations. Not opening the stone presented the danger of finding some inclusions that could not be seen in the rough. Buying rough stones is a gamble, but uncut is where the big profit is, as well as the big loss. I decided it best to bring a buyer here to see the stone himself, in the rough, and have him decide what to do. the questions which remained were how large, how clean, how brilliant, and how much. Teddy Doyle, and Australian ex-SAS commando, married to the daughter of a high-ranking Indonesian general, and Lee Wolf, who had a gem company in Bangkok called Pacific East Trading. Teddy had spent several years in Indonesia before moving to Thailand, where he met up with Lee. They decided to work together, and in 1997 formed a new company called the Opal Factory at Khao Yai, northeast of Bangkok, at the foot of some beautiful mountains near the entry to the national park there. I found out later that the new company was financed by another Australian, a nerdy-looking guy named Max Green. Max, who I met several times at Pacific East Trading's office on Convent Road in Bangkok, turned out to have looted up to 20 million dollars from trust funds under his management. Of that sum, 10 million dollars was said to have been given to Teddy and Lee to run Pacific East Trading, the Opal Factory, and to purchase stones. All of the stone-cutters and polishers at the Opal Factory were handicapped men and women in wheelchairs, and Paul Elmer, the manager, built modified three-wheeled motorcycles for each of them to ride to and from work. Teddy and Lee were very generous. As a practical joke, Teddy had imported real Australian road signs warning drivers of kangaroos, and put them up on signposts on the country roads around the Opal Factory and the national park. The local authorities never even noticed, and the signs weren't removed. Unsuspecting visitors to the area were fooled into thinking that wild kangaroos were hopping around this part of upcountry Thailand. For all I know, the signs are still there. I called Lee from Colombo, and described the orange sapphire. Of course he was interested, he said, and was prepared to fly to Sri Lanka straight away to purchase the stone for cash. Lee had his first chance to see the stone, and offered 25,000 dollars, eventually raising the bid to 40,000 after the first round of negotiation. Dharmaratna must have been disappointed with this bid, as he returned to Balangoda and called me later that afternoon, saying that he had found a buyer for 70,000. I asked him to return to Colombo immediately and to bring the stone with him. He asked me if there was really a reason to return, as the trip was a three-hour drive. I assured him that there was. Calling him back again, he told me that a buyer in Ratnapura had offered him 90,000. Maybe he was bluffing, trying to drive up his price, but he knew we had cash and that we were scheduled to leave soon. His reluctance to return convinced me that he really did have that offer. I knew that if we did not get him back soon, the stone would be bid up beyond the gamble that we were willing to take. Dharmaratna returned later that evening and Lee canceled his return flight to Bangkok. For four hours we negotiated back and forth and, exasperated, Lee finally bought the stone for an even 100,000 dollars. Later in a Chinese restaurant out of Lee's sight, Dharmaratna gave me 10,000 dollars. What would happen now depended on what was inherent in the stone and the skill of the cutter. Lee and I returned to Bangkok, where he and Teddy would decide what to do with the rough. They had paid for it, it was their stone and their decision. Lee, who is not a gemologist, was convinced by somebody that the orange color could be enhanced by burning. Burning a stone at a low temperature to remove 'silk' or to improve the brilliancy or color can be a way of completing Nature's process. It can also be a dangerous operation with unpredictable results. I cautioned them and said that, as it was, the stone would yield a flawless gem of over 100 carats and would be perhaps the finest of its kind in the world. My advice was ignored and they burned the stone. The result was that the rich tangerine-orange was burned out, and what remained was a golden yellow-lemon. Rather than having a fabulous gem worth over a million dollars, they now had at best a 50,000 dollar stone. Worse was to come later. In the meantime, I joined up with a couple of Japanese gem-dealers to assist them in their buying. We bought large, sometimes 100 kilo boulders of jadeite, in Burma. These huge white-and-green streaked monsters were shipped to the Opal Factory at Khao Yai to be hollow drilled into long tubular seals which the Japanese, having the characters of their names etched in the bottoms, use to sign legal documents for real estate and banking transactions. They are called hanko. Some had a very fine medium emerald green color. One afternoon in March 1998, I was with Teddy, waiting for a new batch of hanko to be polished by his workers, when his mobil phone rang. Max Green was dead. He had been murdered in Phnom Penh, Cambodia, in room 511 of the Sofitel Cambodiana. It was a very professional job. The hallway cameras had either been disabled or the film removed.Whoever had murdered Max was extremely angry. Stealing 20 million dollars would make many people angry. Max's head had been smashed completely. His gold Cartier watch, his cash, passport, credit cards were still in the room. Only his laptop was missing. He was so disfigured that he could only be identified by dental records. Later in Melbourne, by court order, he was exhumed to prove it actually was him. It was. So who killed Max Green? Who knows? I can say for sure that it was not Teddy Doyle, as the Australian press had suggested. I know because I was with Teddy at Khao Yai when Max was murdered in Cambodia. After Max's death, the money dried up, and the businesses were closed. Teddy was said to have gone to England. Lee was said to have gone to Pattaya to manage a bar. I lost the share I would have received from that unrealized magnificent orange gem, but at least I did walk away with 10,000 bucks. Tragic loss to the gem world out of stupid greed. Today, you could not touch a flawless 100+ carat vivid un-heated orange sapphire for under US$50,000/ct. In the immortal words of Forrest Gump: "Stupid is as stupid does". My 15 year old daughter asked "why didn't they cut off that little knob on the right side and test burn it first"? Ah yes, the simple wisdom of innocent youth.